The severe disturbance of the energy balance of the atmosphere ensuing from the emission of over 320 billion tonnes of carbon since 1750 threatens a shift in the state of the atmosphere/ocean system to ice free greenhouse Earth conditions. Based on the recent Copenhagen Synthesis Report, climate change trends at the top range of IPCC 2007 projections, and the identification of tipping points in the recent history of the atmosphere/ocean system (ie at 14-11,000 years ago and 8.2 thousand years ago, the scale and pace of 21st Century climate changes require re-consideration of mitigation and adaptation strategies. Top: Atmospheric CO2 and continental glaciation 400 Ma to present. Vertical bars mark the timing and palaeo-latitudinal extent of ice sheets. Plotted CO2 records represent five-point running averages from each of the four major proxies: stomata leaf pores, phytoplankton, Boron, pedogenic carbonates. Middle: Global compilation of deep-sea benthic foraminifera 18O isotope records from 40 Deep Sea Drilling Program and Ocean Drilling Program sites updated with high-resolution records for the Eocene through Miocene interval. Bottom: Detailed record of CO2 for the last 65 Myr. The range of error for each CO2 proxy varies considerably, with estimates based on soil nodules yielding the greatest uncertainty. Also plotted are the plausible ranges of CO2 from three geochemical carbon cycle models. Feedbacks from the carbon cycle, including release of methane from permafrost, polar sediments and bogs, and feedbacks from ice melt/warm water interaction dynamics, accelerate this process. In view of the cumulative nature of CO2 in the atmosphere, at current growth rates of about 2 ppm/year, and rising above the combined CO2 + methane level of 450 ppm, the atmosphere/ocean system is fast tracking toward conditions similar to those on an ice-free Earth. 2. The scale of such greenhouse event may, or may not, bear an analogy to the PETM (Paleocene-Eocene Thermal Maximum) event about 55 million years ago, including release of large volumes of methane. Recent methane release from Siberian permafrost, lakes and shallow sediments counsel caution. 3. 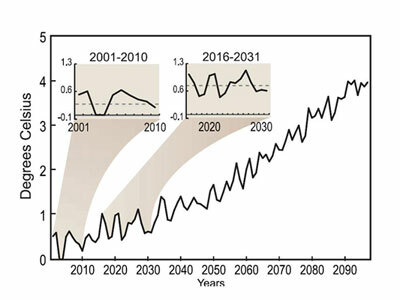 Due to hysteresis (retardation of effect after cause), the effects of temperature rise, superposed ENSO (El Nino Southern Oscillation) cycles (Figure 2), the consequences, including melting of Greenland and the west Antarctic ice sheets, sea level rise, possible collapse of the North Atlantic Thermohaline Circulation, and potential tipping points (Figure 3), lag behind CO2 rise by as yet little-specified periods. A shift of the climate system through a transitional stage is occurring at present and is associated with extreme weather events, including the Australian droughts and floods. 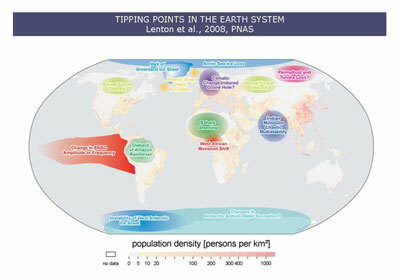 Map of potential policy-relevant tipping elements in the climate system, overlain on global population density. Subsystems indicated could exhibit threshold-type behavior in response to anthropogenic climate forcing, where a small perturbation at a critical point qualitatively alters the future fate of the system. They could be triggered this century and would undergo a qualitative change within this millennium. We exclude from the map systems in which any threshold appears inaccessible this century (eg, East Antarctic Ice Sheet) or the qualitative change would appear beyond this millennium (eg, marine methane hydrates).  Question marks indicate systems whose status as tipping elements is particularly uncertain. 4. With a mean global temperature rise of about 0.8 degrees C since 1750, plus a rise of about 0.5 degrees C masked by sulfur aerosols emitted by industry, plus temperature rise due to ice albedo loss and infrared absorption by water, in particular the Arctic Sea, global warming is tracking toward 1.5 degrees C.
At this rate, conditions which existed on Earth about 2.8 million years ago (mid-Pliocene +2 to 3 degrees C; Sea level rise of 25+/-12 meters could be reached within time frames of a few decades. 5. 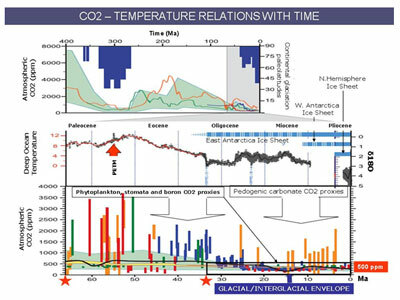 The unique nature of the "experiment" Homo sapiens is conducting with the atmosphere through the emission of more than 320 billion tons of carbon by 2007, and the consequent extreme rise in atmospheric CO2 of about 2 ppm/year, two orders of magnitude faster than during the last glacial termination, counsels caution. John Holdren, Obama's science advisor, compared global warming to "being in a car with bad brakes driving toward a cliff in the fog." 2. Global reforestation efforts in semi-arid and drought-effected regions, among other providing employment to millions of people. 3. Construction of long-range water conduits from flood-affected to drought-stricken regions (an even more important task than designing Broadband networks...). 4. Urgent development of atmospheric CO2 draw-down methods, including CO2-sequestering vegetation, soil carbon enrichment, sodium hydroxide-based CO2 capture (a technology no more complex than space projects technologies and financially not more expensive than military expenditure). 5. Rapid transition to clean energy (solar-thermal, hot-rock, hydrogen, wind, tide, photovoltaic) and transport systems (electric vehicles). It is possible that, in order to gain time, some governments may opt for geo-engineering efforts, including stratospheric injection of sulfur aerosols (simulating volcanic eruptions), likely over polar regions, meant to temporarily raise the Earth albedo while other measures are undertaken. The alternative to urgent fast tracked mitigation efforts does not bear contemplation.